Valued for their tuition dollars and the diversity they offer, foreign students in U.S. colleges have nearly doubled their numbers over the last ten years. American universities are enrolling unprecedented numbers of foreign students, prompted by the rise of an affluent class in China and generous scholarships offered by oil-rich Gulf states such as Saudi Arabia. Cash-strapped public universities also are driving the trend, aggressively recruiting students from abroad, especially undergraduates who pay a premium compared with in-state students. There are 1.13 million foreign students in the U.S., the vast majority in college-degree programs, according to a report to be released Wednesday by the Department of Homeland Security. That represents a 14% increase over last year, nearly 50% more than in 2010 and 85% more than in 2005. The active recruitment of foreign students raises concerns that they are crowding out opportunities for U.S. students. “There is a widespread notion that dollars are being spent on foreign students and that they are displacing U.S. students, even if in general that isn’t right,” said John Bound, a University of Michigan economist who has studied the influx. Foreign tuition money subsidies U.S. students. Schools need the tuition money. One way to look at it is that full-pay international students actually help subsidize the education of U.S. students who receive financial aid. Miriam Jordan, “International Students Stream Into U.S. Colleges”, Wall Street Journal, March 24, 2015. For the first time in years, the rise in tuition at many colleges is expected to be below the rate of inflation. Today’s college students are more aware and informed about rising costs and financial aid, and more sensitive to price. That’s going to put ongoing pressure on the whole higher education industry’s finances, according to a Moody’s report (paywall) which gave a gloomy outlook for the whole sector. A severe version of this is putting major pressure on US law schools, which are actively competing on tuition (paywall) for students, slashing faculty, or closing altogether. Since the 1970s, US tuition costs for undergraduate and graduate degrees have climbed to historic highs. But tuition hikes have slowed substantially as the number of schools have grown, spurring more competition. Max Nisen, ” People are getting smarter about college costs and it’s squeezing the whole industry”, Quartz, December 4, 2014. Is this really news to most people? The vast majority of students at American public colleges do not graduate on time, according to a new report from Complete College America, a nonprofit group based in Indianapolis. At most public universities, only 19 percent of full-time students earn a bachelor’s degree in four years, the report found. Even at state flagship universities — selective, research-intensive institutions — only 36 percent of full-time students complete their bachelor’s degree on time. Every extra year costs thousands of dollars. Students who require remediation, transfers between colleges, and too many course choices are blamed for failure to graduate on time. Each year, the report said, 1.7 million students begin college in remediation, including a majority of community college students — but only one in 10 remedial students ever graduate. Also, 60 percent of bachelor’s degree recipients change colleges, with almost half of them losing some of their credits when they transfer. Too much choice in college catalogs contributes to the problem, the report said, often overwhelming 18-year-olds “with an enormous cafeteria of possibilities in the college curriculum” and too few counselors to help them chart their course. Here are some more “Common reasons for failing to graduate college in four years”. Tamar Lewin, “Most College Students Don’t Earn a Degree in 4 Years, Study Finds”, New York Times, Dec. 1, 2014. New York Times economics pundit Eduardo Porter explains “Why Aid for College Is Missing the Mark”, allowing ‘colleges “blithely to raise their tuitions,” at little benefit to students’. In 1987, when he was Ronald Reagan’s education secretary, the conservative culture warrior William J. Bennett wrote a famous essay denouncing federal aid for higher education because it allowed colleges “blithely to raise their tuitions,” at little benefit to students. Nearly two decades later, it seems, he was broadly right. Indeed, he didn’t know the half of it. Porter comes down on for-profit colleges, leaders in enrolling low-income students. But their higher tuition does not produce consistently successful outcomes. Low-income students in the United States often end up with the short straw: no degree, no job and a bundle of debt that they must pay anyway. The level of government spending on higher education does not seem to be at the heart of the problem. State and local financing for public higher education fell to some $76 billion last year, nearly 10 percent less than in 2003 after inflation. On a per-student basis it is 30 percent less than it was a decade ago. But that doesn’t mean there is less government money in the system. Federal aid to college students more than doubled over the period, to some $172 billion last year. Of that, nearly 25 percent went to private, for-profit colleges. Porter believes the “case for government financing of college is as strong as ever”, but the method of allocation is “wasting both money and opportunity”. Although I may disagree with his specific recommendations to fix the problem, I wholeheartedly agree with the need “to curb abuses arising from the haphazard distribution of billions of dollars of taxpayer funds with very little accountability”. Eduardo Porter, “Why Aid for College Is Missing the Mark”, New York Times, October 7, 2014. Taxpayers subsidize private elite universities at a rate that is ten times higher than that for public universities. Generous tax deduction policies are the reason for this imbalance, according to Robert Reich’s opinion piece, “The Ivy League is ripping off America”. These tax subsidies are on the rise because in recent years a relatively few very rich people have had far more money than they can possibly spend or even give away to their children. So they’re donating it to causes they believe in, such as the elite private universities that educated them or that they want their children to attend. Private university endowments are now around $550 billion, centered in a handful of prestigious institutions. Harvard’s endowment is over $32 billion, followed by Yale at $20.8 billion, Stanford at $18.6 billion, and Princeton at $18.2 billion…. Because of the charitable tax deduction, the amount of government subsidy to these institutions in the form of tax deductions is about one out of every three dollars contributed. Tax deductions boost per-student government spending at elite private universities to amounts significantly higher than spending at public universities. The annual government subsidy to Princeton University, for example, is about $54,000 per student, according to an estimate by economist Richard Vedder. Other elite privates aren’t far behind. Public universities, by contrast, have little or no endowment income. They get almost all their funding from state governments. But these subsidies have been shrinking…. That means the average annual government subsidy per student at a public university comes to less than $4,000, about one-tenth the per student government subsidy at the elite privates. A flat tax could be the solution. Reich asserts there is no justification for this inequity, but does not go so far as to propose cutting tax deductions for contributions to private universities. Perhaps he agrees with the majority of Americans who favor a flat tax, which would likely eliminate most deductions, including those for contributions to private universities. Robert Reich, “The Ivy League is ripping off America!”, Salon, October 16, 2014. Borrowing for college among high-income families increased from 24% to 50% over the last twenty years. Similar increases occurred among middle-income families. … A new Pew Research Center analysis of recently released government data finds that the increase in the rate of borrowing over the past two decades has been much greater among graduates from more affluent families than among those from low-income families. Fully half of the 2012 graduates from high-income families borrowed money for college, double the share that borrowed in 1992-93.1. These numbers show how college affordability is no longer just an issue for low-income families, but now affects families across the income spectrum. What has changed over the course of roughly two decades then is the pervasiveness of student borrowing across income groups: In the early ’90s, only among graduates from low-income families did a majority of graduates finish college with student debt. Now, solid majorities of graduates from middle-income families (both lower-middle and upper-middle) finish with debt, and half of students from the most affluent quartile of families do the same. 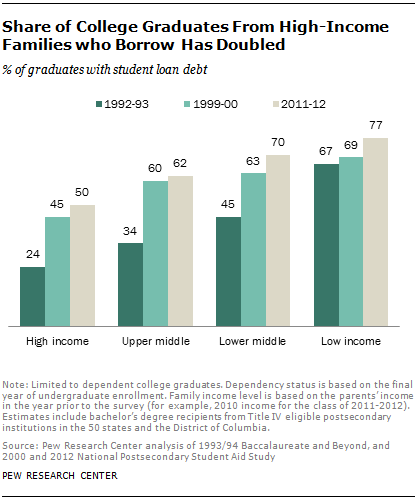 Richard Fry, “The Changing Profile of Student Borrowers”, Pew Research, October 7, 2014.